DUBAI: Famous Pakistani VJ-singer Mathira has been injured in a car accident in Dubai on New Year’s eve. She took to her social media to share details about the accident. 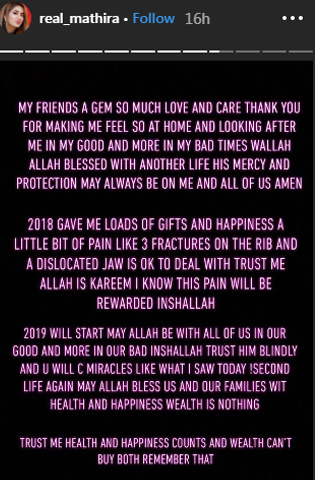 Updating her fans by posting stories on her Instagram stories, Mathira wrote that she was with a friend while they were driving on the roads of Dubai when two trucks hit their car. She further mentioned that she has three fractures on her ribs and a dislocated jaw, yet she was thankful for being alive.